The Metro Student Field Trip Program curriculum provides teachers and students the tools to learn the safest ways to ride the Metro system. 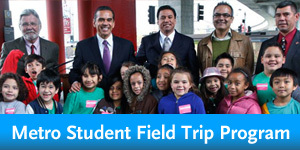 Carefully review and complete each step in order before submitting the Metro Student Field Trip request form. Follow these simple steps to complete the required curriculum. After you and your students have reviewed the bus, bike and rail safety rules on the chalkboard, move the curser to the desk and click on the piece of paper to begin taking the safety quiz. After completing the safety quiz, enter your name and then click on the pop-up to get a printable certificate. Write down the Certificate of Completion MSFT code (appears to the right of your name). You will need to include this code in your trip request form. Click on the three links below to review a complete list of safety tips; learn how to plan your trip; know the types of fare accepted; and understand the Rules and Regulations for riding Metro.